With the proliferation of news headlines and diversification of the addressed topics, it is quite difficult to organize this large volume of information. Here is a tool that might help. Onemoretab is a monitoring solution that allows you to create your custom news portal, by selecting your favorite newspapers and headings. Onemoretab is quite similar to Netvibes, but its specificity is that it is dedicated to the French press. The service is available for use without registration. 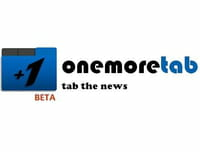 Create a news portal on Onemoretab. Published by deri58. Latest update on January 29, 2013 at 08:29 AM by deri58. This document, titled "Onemoretab - create your custom news portal," is available under the Creative Commons license. Any copy, reuse, or modification of the content should be sufficiently credited to CCM (https://ccm.net/).